01: Recruiting speeches of the period. 02: Hundreds of tars were drowned when the Royal George keeled over. 04: The need for potash created wide open spaces in Massachusetts. 05: 'Passing fair' - praise or condemnation? 06: 'Shame be to him…' - the Most Noble Order of the Garter. 07: The drinking song that became a national anthem. 08: 1775 news as seen by a modern journalist. 13: One of our number visits a school. 14: In George's own words: The Battle of trenton. 15: Our slow march and its opera. 16: Thacher's military journal for 1776. 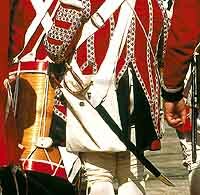 17: The change from red coat to khaki battledress. 18: Thacher's military journal for 1775. 23: Words: chop & slice. 27: Words to 'British Grenadiers". 29: the formation of a national army in England. 30: A soldier opened the first circus. 31: England's main industry: wool. 32: Maybe London streets weren't so clean! 34: The end of officers' commissions. A tragic misjudgment resulted in the deaths of our tars. A little-known story, that explains the landscape, and much more. To be fpoken with gufto. with a link to an online source with the rest of his diary. Clarification of the useful period word "passing"
Winston uses it...what does it mean? Where did this word come from, anyway?